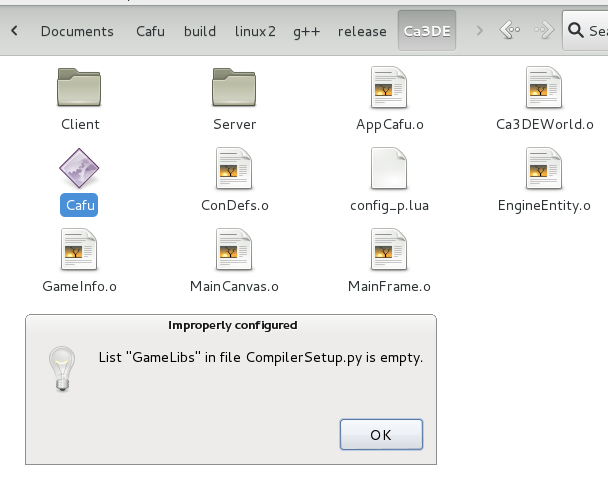 I downloaded the source files, and compiled them on Debian 7 with simply running "scons -j 4"
After building was complete, i checked out the files (/Cafu/build/linux2/g++/release) and tried to run /Ca3DE/Cafu, but it gave me an error stating the gamelibs were empty. I saw a thread on here via Google saying that someone else had the same problem, but he had to "put Cafu.exe in the root folder". I tried putting the Cafu launcher in the release folder rather than the Ca3DE subfolder, but it didn't change anything. Toom wrote: I downloaded the source files, and compiled them on Debian 7 with simply running "scons -j 4"
This looks good, but just for clarity, what do you mean by "downloaded" (which version? is this a Git clone?) and what by "checked out the files"? After running "scons -j 4", did you try running the program directly from the top-level Cafu directory (without copying it anywhere) as described at item "3." in section Running the new Programs? Thanks for the help, Carsten. I see where i went wrong now. With the root folder i thought they meant the folder of that certain profile (release, debug..). It works now, thanks again.